In fact, it’s probable I should. I’ve corrected the slight oversight of putting a seam on the top side (thanks to the advice I received here,) I’ve got the one-inch area where the seam pulled apart reassembled and I’ve got the pieced border attached. It sits at 55″ x 60″, a respectable “curl up on the couch”-sized quilt. It looks good. I’m so tempted, though, to put another white border on it. This is ill-advised, because a white border will definitely show the imperfections that will be prevalent, perhaps ubiquitous, in my binding. I should stop here. But will the binding get totally lost in the pieced border? Is that maybe a good thing? 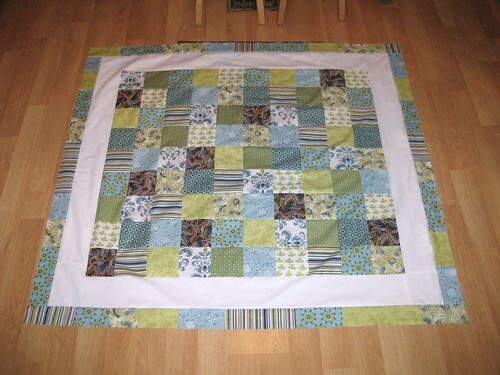 After payday, I may be able to afford the darning foot, batting and backing to actually turn this into a proper quilt. 😀 I may forgo the free motion quilting on the first shot, though, and just go in straight lines. Maybe vertical stripes.